I first stumbled upon Quince and Co a couple of months ago and was immediately smitten with their beautiful pattern selection. The yarns sounded exciting too and I cannot tell you how much I love the fact that they use the same colour palette across the entire yarn range. I don't know why more yarn companies don't do this and I have no idea why it makes me so happy, but it does. Quince and Co is the baby of knitwear designers Pam Allen (former Interweave Knits editor) and Carrie Bostick Hope alongside historic mill rescuer Bob Rice. I fine pedigree indeed. After several months of cyber stalking I could bear it no longer and placed an order. This is glorious Lark in Peacock. It is all that I hoped: soft, squishy, gorgeous saturated colour. It came wrapped in a brown paper bag and the enclosed compliments card had a handwritten note of thanks. Perfect in every way. And in case you don't want to pay Royal Mail's rather irksome £8 handling fee (although even with that added on this yarn still works out at a very fair price compared to something like Rowan) the good news is that I have been reliably informed that Loop will be stocking Quince and Co yarn in the not too distant future. Thanks for the introduction. I skimmed right over to their web site and had a very satisfying visit indeed. I can only imagine how much it would cost to ship this beautiful yarn overseas!! Very nice! Peacock is my favourite colourway of theirs. Looking forward to hearing how you like knitting with it! I've yet to try Quince myself. "Peacock". 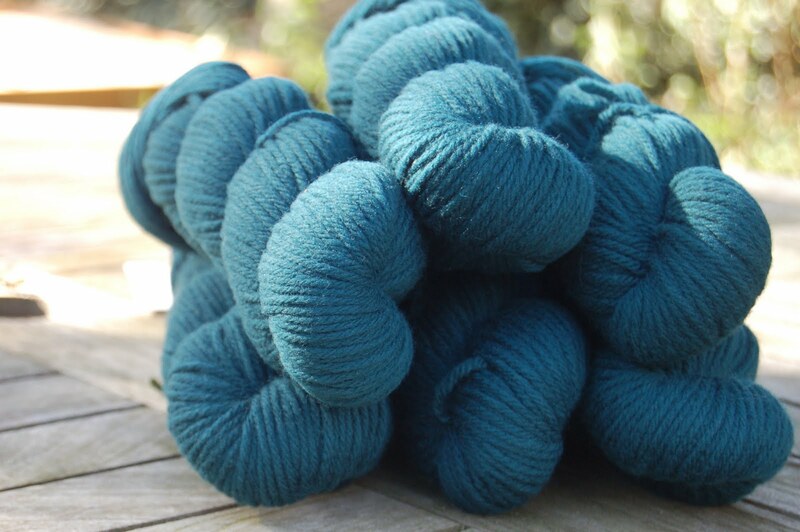 How could anyone resist wool in a shade called Peacock? 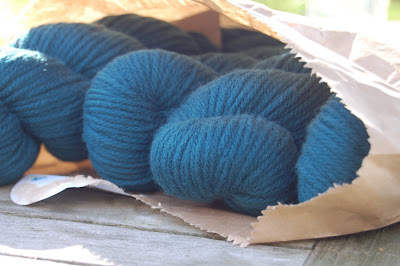 I have been looking at the quince yarns for some time too. The article in the winter interweaves was really interesting! What are you going to make? I've been cyber stalking their site too. Love to hear and see how it knits up. Love that colour! Very nice, Love that colour! Aren't the colors gorgeous? And it's so lovely to knit with too! I've knit with Lark and Osprey and am just about to try the sock yarn. They are lovely yarns, aren't they? I love Chickadee for Fair Isle patterns. The colors are gorgeous. 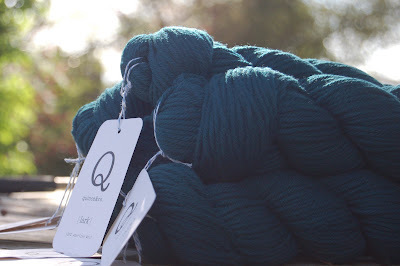 I have been determinedly resisting this yarn for aaaaages, but it looks incredibly beautiful. I'm hoping Loop might have it by the time I next go up to London. love the color Rebecca. 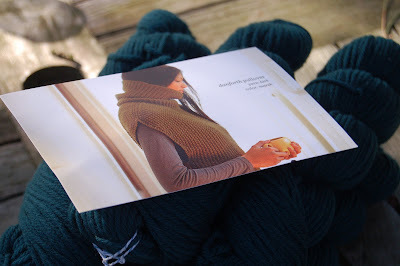 Can't wait to see what you knit with it! I will not look at the website, I will not look at the website. I will you know! I can't resist. It looks so gorgeous I can almost smell it. What are you going to make with it? I love the colour - and like skybluepinkish I will try to resist!! Yes! Quince and Co. is Maine-based (Portland) and I made it to Knit Wit, which handles their yarn retail, on my February weekend away there! I love their Osprey, and made my chic teenage son a "hipster hat" (his name) out of it--lovely hand, nice loft, sort of a dry feel. I'm considering a sweater for myself now! Just gorgeous -thanks for referencing the quince & co website - it looks amazing - and is way too tempting! Gorgeous colours and like you, I love the fact that the colours carry across all the yarns - how eminently sensible! What are your plans for this beautiful blue yarn? The colour blue reminds me of the fine weather that I'm missing in England at the moment. My husband just called me to say that he is enjoying a G&T in the garden! And lo, the Ravelry queue grows longer - you have an eye for knitting stuff I just adore.